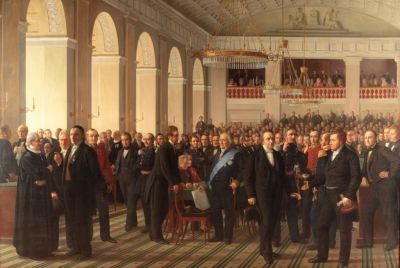 June the 5th 1849 was the day that Denmark went from having a king with absolute power to being the constitutional monarchy we are today. The constitution has been changed several times since. Latest in 1953. The politicians always made sure that the new constitutions were signed on June the 5th to maintain that date as constitution day. This piece of music is a classical piece that celebrates this important law which is the foundation of our democracy and our human rights. The music is for a full classical orchestra and one tiny synth. It starts in A minor, modulates to C major and back to A minor. It ends in full steam in E major. It has some Nordic melodic influence in the minor key parts and the major key parts play a melody that expresses celebration.